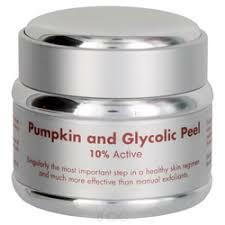 Pumpkin products offer antioxidants and enzymes that act like alpha-hydroxy acids. But rather than just peeling the skin of unwanted materials, the pumpkin products also replenish the skin with nutrients. They weaken bonds that hold dead skin cells together. When these bonds are weakened, the dead cells can be shed from the surface of the skin, resulting in skin that appears fresher, smoother and younger.